The Clean India Trail Initiative by Sangeetha Sridhar, in a Tata Hexa, reached Bangalore today. 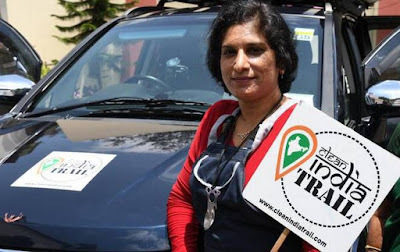 After covering the western, eastern and northern region of the country, Ms Sridhar is all set to continue her expedition in the southern region. Commenced on the 12th of August, 2018 from the iconic Gateway of India in Mumbai, the Clean India Trail rides on the Swachh Bharat Mission and to spread awareness about Mahatma Gandhi’s vision of a clean India. As part of the Clean India Trail programme, Ms. Sridhar will drive the Tata Hexa across 150 cities in India, covering around 40,000 kilometers, to conduct a first-hand experiential assessment of toilet and sanitation facilities, the condition of national roads and highways and the safety quotient for solo woman travelers. To mark the 150th year of the Tata Group and the 150th birth anniversary of Mahatma Gandhi, Tata Motors had partnered with Ms. Sangeetha Sridhar, to drive a unique initiative called the ‘Clean India Trail’. For the same, Ms. Sridhar has chosen Tata Hexa – the lifestyle SUV from the Company, as her vehicle of choice keeping in mind her requirement of a luxurious and reliable all-terrain vehicle. Powered by a 2.2L Varicor diesel engine and producing a whopping 154 BHP at 400 NM of torque, the Hexa offers spacious and luxurious interiors, making it the most suitable vehicle for long journeys and her expedition. Keeping the requirements of the drive in mind, the Tata Hexa has been converted into a 24 sq. ft. home on wheels, with a sleep area, kitchen sink, chiller box and work space with charging points for Ms. Sridhar’s gadgets. Additionally, the wide network of Tata Motors authorised service stations across the country will be a call away to help her in case of any service requirements through this journey.